This week the Best Comics list highlights a number of exciting new releases such as Saga’s monumental 50th issue and the next chapter in The DC/Watchmen crossover, Doomsday Clock. 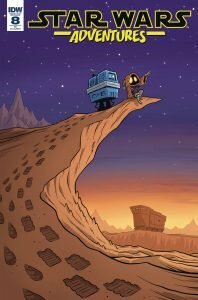 For the past two weeks the Best Comics list has featured books from DC Comics’ Young Animal line and this week there’s another exciting addition. 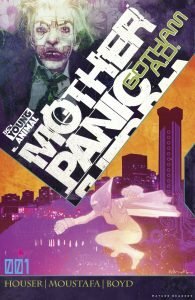 Mother Panic Gotham A.D #1 picks up after the events of Milk Wars and takes place in a different Gotham City, 10 years in the future. In this reality, Batman doesn’t exist and the city has been taken over by a group called the Collective who have a zero-tolerance policy towards caped crusaders and masked vigilantes. While that setup is interesting in and of itself, what makes this series stand out is the use of Batman’s most iconic villain. This issue features a sad version of the joker who now makes balloon toys shaped like tommy guns and machetes on the abandoned Gotham docks. Since Batman is so instrumental in Joker’s psychosis it will be interesting to see what kind of person the Joker is without the existence of Batman. 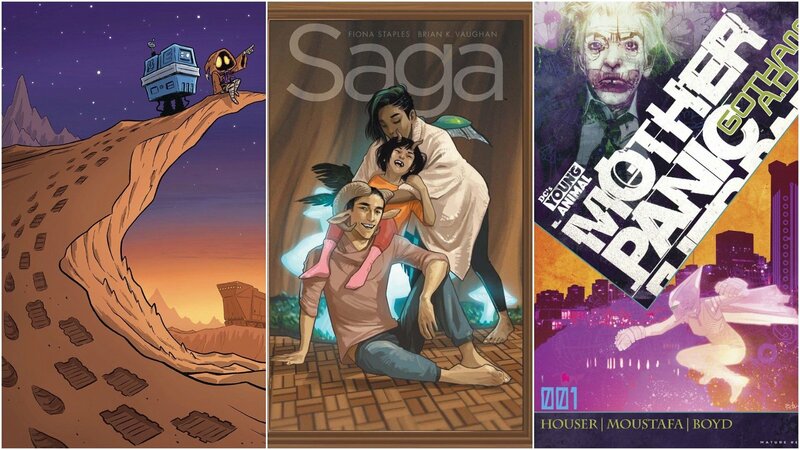 It’s hard to believe that Saga has been around since 2012. Over the seven years since its launch Saga has managed to tell an unexpected and emotionally driven story full of cliffhangers and twists. 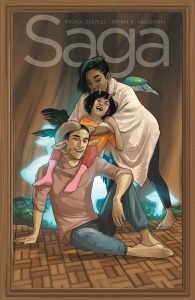 Saga tells a Romeo and Juliet inspired-story that focuses on a husband and wife named Marko and Alannah that come from long-warring extraterrestrial races. The series is narrated in the future by their newborn daughter Hazel, who Alannah gave birth to way back in issue #1. While the series has been full of turmoil it has recently been rather peaceful for Alanna, Marko and their family. But knowing Brian K. Vaughan and his uncanny ability to pull the rug out from under readers, I take this happiness with a grain of salt. Perhaps even more impressive is the fact that the creative team of Brian K. Vaughan and Fiona Staples have worked on every issue since the series debuted. In that time they have combined to form a legendary duo and Fiona’s stunning art has mixed all-but seamlessly with Brian’s harrowing scripts. Saga is also one of the few comics that has consistently stuck to the $2.99 price point making it one of the best deals in comics as well. The new Valiant Universe launched back in 2012 and has seen a number of relaunches since. 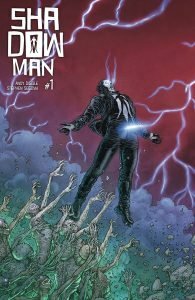 Shadowman #1 is another such relaunch and features a different person behind the Shadowman persona than the original series. This time Shadowman is Jack Boniface, an outcast looking for his place in the world, except instead of finding acceptance and companionship he finds himself fusing with a millennia-old voodoo spirit and gaining mystical powers. This is an exciting first for the Valiant Universe as having someone take up the mantle of an old hero hasn’t happened as of yet. It’s also been a while since Andy Diggle has worked on a superhero project and with the generally cohesive universe that Valiant possesses, this series should be very accessible. 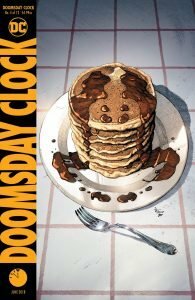 One of the biggest surprises so far involving DC Comics event series Doomsday Clock is how grounded and focused the series has been. The series is the first crossover between the mainline DC Universe and Alan Moore’s seminal Watchmen Universe and involves Watchmen characters coming to the DC Universe in hopes of saving the world. The thing is that while we have gotten a few moments involving DC Comics characters, like back in issue one with Superman having a nightmare and recently with Batman interacting with Rosrach, these moments have been sparse so far. Instead, the series has focused on Watchmen mainstays Ozymandis and *spoiler* a new version of the murdered vigilante Rosrach, along with two new characters. The moments featuring DC comics characters have been the standouts at this point and issue four promises more interaction, involving Lex Luthor, Batman and a suddenly not dead Comedian. This is a book that’s doing crazy things and one you don’t want to miss. Back in the New 52 Sholly Fisch was the writer on the Action Comics backup stories and his top-notch tales managed to outshine main story writer and wizard at-large Grant Morisson. When Morrison left the series many fans hoped that Fisch would take over the series but that unfortunately didn’t happen. Since then Sholly Fisch has mostly worked on all age comics and his previous issue on Star Wars Adventures was lots of fun. It’s refreshing to see a company other than Marvel work on Star Wars comics and Star Wars Adventures’one-off tale format is a welcome alternative to the story arc driven narratives of Marvel’s Star Wars stuff. Fans of the Star Wars Rebels TV show should especially check this issue out as it features the conclusion of a story arc featuring series mainstays Ezra Bridger and Kanan Jarus. Also with Rebels recently coming to a close, this is the perfect opportunity for fans to get some quality Rebels action and it may just help you cope with the fact that the series is over and never coming back. Liked this article and want to read more like it? Check out our Interview With Howard Chaykin and the list of 5 Stellar Graphic Novels.